Transportation is relevant for economic development, for the trade, education and health system. Transport in Africa is hard and expensive, according to a study of world bank more expensive than in Europa and 6x more expensive than in Pakisthan. Fossil fuels has to be transported over hundreds of miles - on weak infrastructure. While affordable solar electricity powering electric vehicles can be produced on the spot. The suggested Ranger EV is versatile on bad roads and can load more than 400 kg. 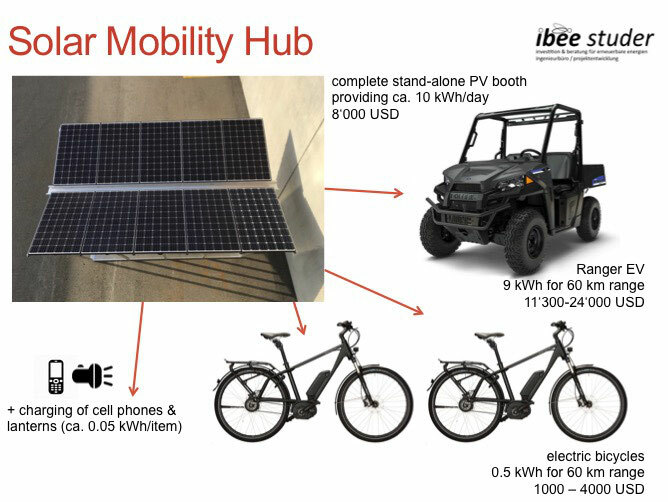 The stand-alone PV booth supplies power for e-vehicles, e-bicycles and other items. Compared to driving 50 km on 300 days, about 1'000 litres of petrol can be saved by one hub annually.